“Wait! Stop!” I whisper, barely managing to keep my voice down. Fabian, the native Kichwa park ranger, doesn’t understand English but he gets the idea. The canoe glides to a graceful standstill. Roberto, the Ecuadorian guide who has just flown with me from Quito speaks excellent English, but is too polite to ask the cause of my excitement. All he did was to casually point out a bird a few feet away in the thick jumble of rainforest; a large bird that looks like a chicken on a bad hair day and has an excessive fondness for fluorescent turquoise eye shadow. “The bird. It’s a hoatzin,” I exclaim. He confirms matter-of-factly. He clearly fails to grasp the significance of the moment. So does the bird that has by now been joined by two of its brethrens, the three of them now engaged in a raucous argument while enthusiastically devouring the foliage. 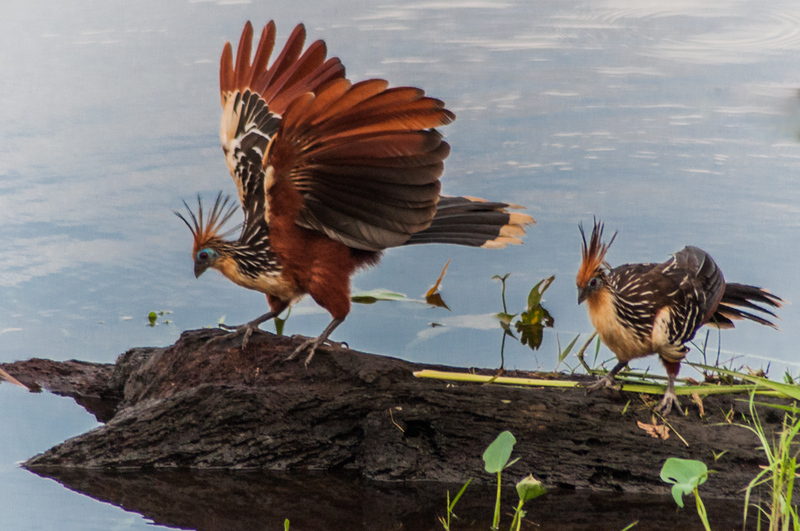 Hoatzin birds on the shore of Anangucocha Lake. I explain that on a previous Amazon adventure several years ago, thousands of miles from here in Peru, I had spent a whole week (including a steamy half-day hike in spongy, mosquito-infested underbrush, I omit) in hope of seeing a hoatzin. All I got for my efforts was to hear its screechy cry and ponderous take-off as it disappeared into the forest canopy. “You’ll see plenty of them here,” Roberto assures me. 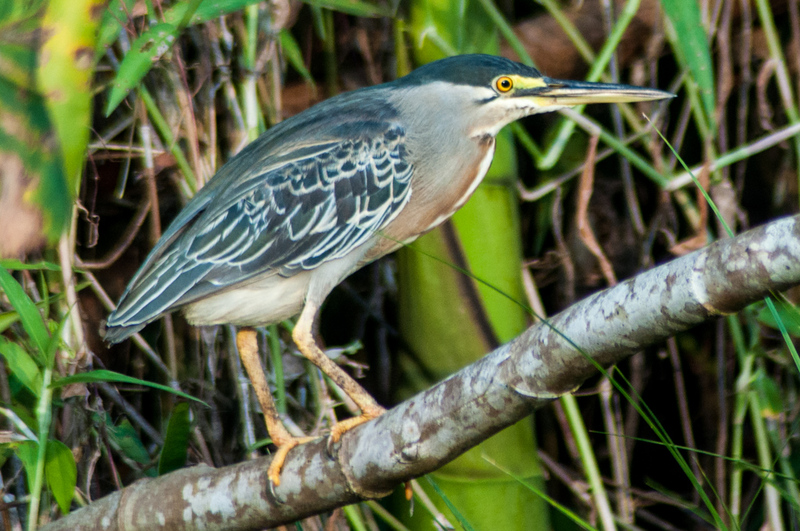 Then, after I have photographed the trio to my heart’s content, he points behind me to a large russet-colored heron, still as a stump to better blend into the undergrowth, “and we have rufescent-tiger herons too,” he smiles. 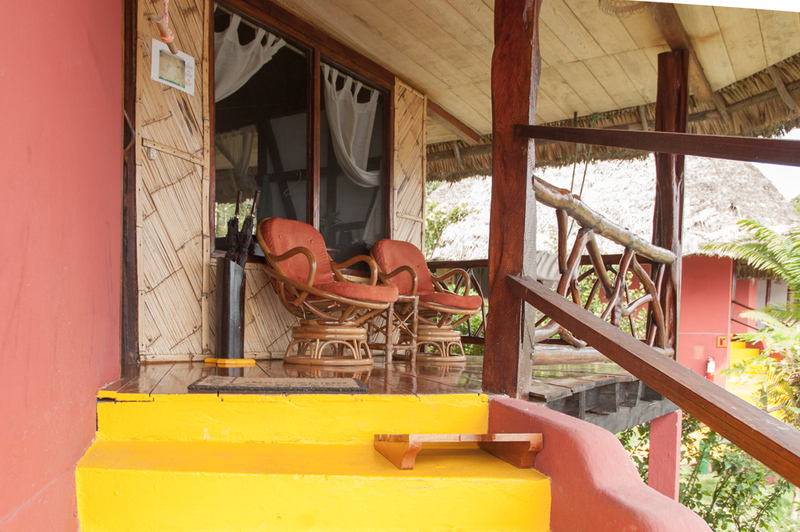 The Napo Wildllife Center eco-lodge streches along the shore of Anangucocha Lake. 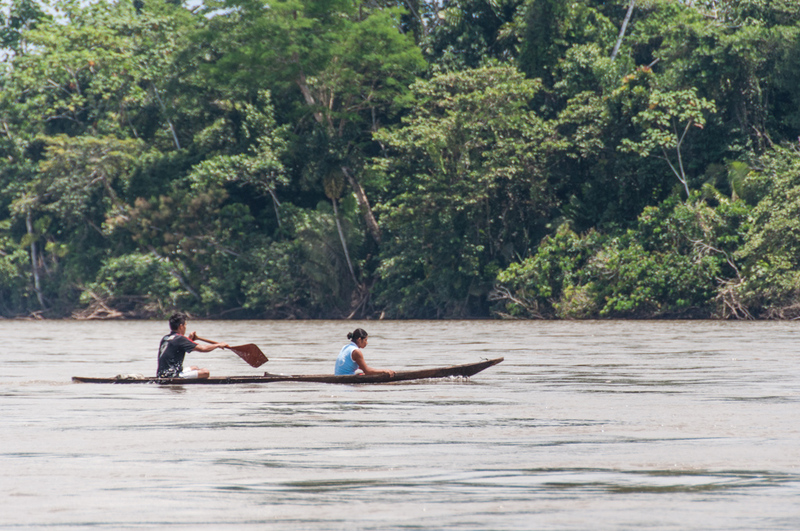 We resume our upstream journey under an arch of tangled mangroves and vines, along the narrow channel that connects the Napo River, a major tributary of the Amazon, to Anangucocha Lake. 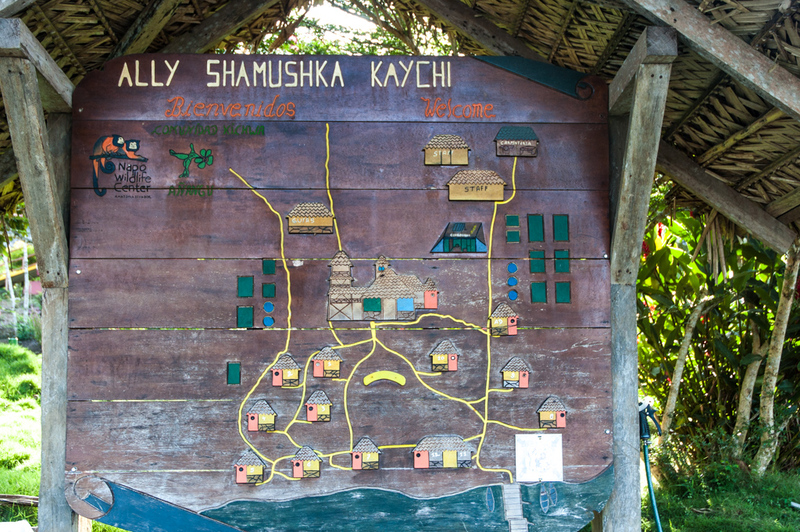 We are in the heart of 21,400 hectares (82 square miles) of conservation land located on the ancestral territory of the Kichwa Anangu community in the northwest corner of Ecuador’s Yasuni National Park, a UNESCO Biosphere Reserve regarded by scientists as one of the highest bio-diversity areas on the planet. We stop for several additional notable sightings, including a three-toed sloth and saki monkeys, my first ever sighting of these tiny white-faced primates, before we reach the lake. Welcome to the lodge. My bungalo is the bottom left one. 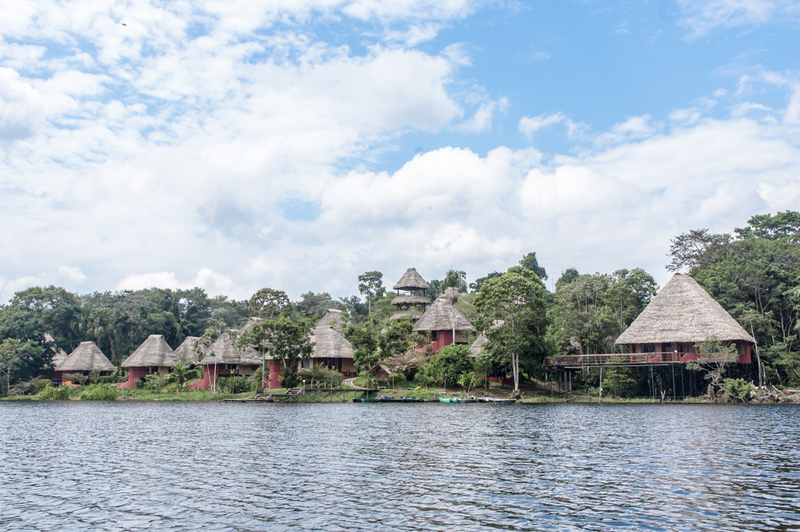 The persimmon-colored adobe bungalows under peaked thatched roofs of the Napo Wildlife Center eco-lodge are scattered around a gentle slope rising from the far side of the lake. The lodge and the conservation land are wholly owned and managed by the Kichwa Anangu community. They are the touchstone of a groundbreaking program initiated over 15 years ago to improve the quality of life of the Anangu people while preserving the integrity of their ancestral territory and culture, and provide them with sustainable employment. 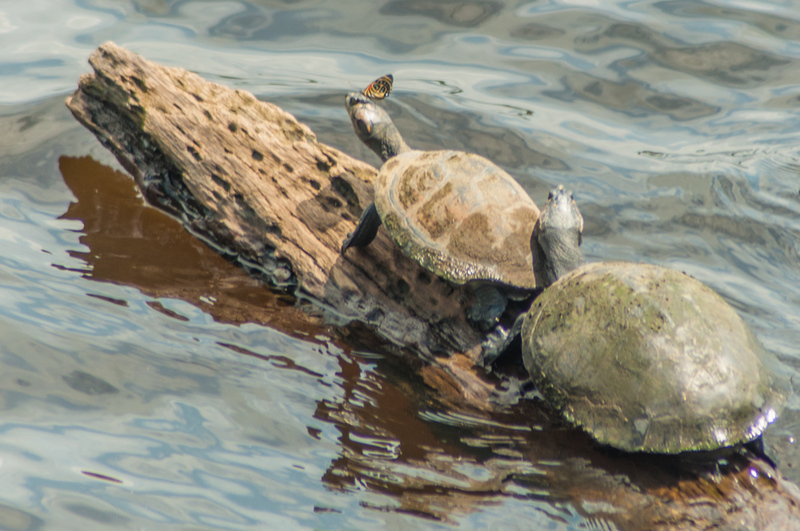 Turtles enjoy the midday sun on the the lake. The lodge is designed to meet the high expectations of international visitors, including airy individual bungalows with well-appointed bathrooms and generous hot water pressure. There is round the clock electricity and WiFi connectivity throughout, including the hammock on my private terrace overlooking the lake. Soaring observation towers at the top of the hill and deep in the forest offer a unique perspective of the lake and the rich bird life above the forest canopy. My bungalo is a haven of creature comforts by the lake. After almost two decades of unrelenting preservation efforts and community education, the conservation land offers some of the most pristine rainforest environment I have come across anywhere. Thanks to strict anti-poaching policies and enforcement, wildlife abundance and variety are outstanding. To ensure visitors make the most of this exceptional environment, Napo Wildlife Center guides come in pairs: a highly experienced bilingual, state-licensed guide and a native Yasuni park ranger who, in addition to his first-hand knowledge of the habits of the local wildlife, is also a fount of information about Kichwa cultural traditions and botanical medicine. One evening, we take a nighttime canoe ride along the maze of convoluted channels that surround the lake. We use a dim spotlight to view nocturnal critters, a rare experience that hadn’t been available during previous rainforest explorations. A memorable close up sighting of this nocturnal escapade is a rather large caiman that glares its disapproval at our intrusion before silently fading into the swamp. 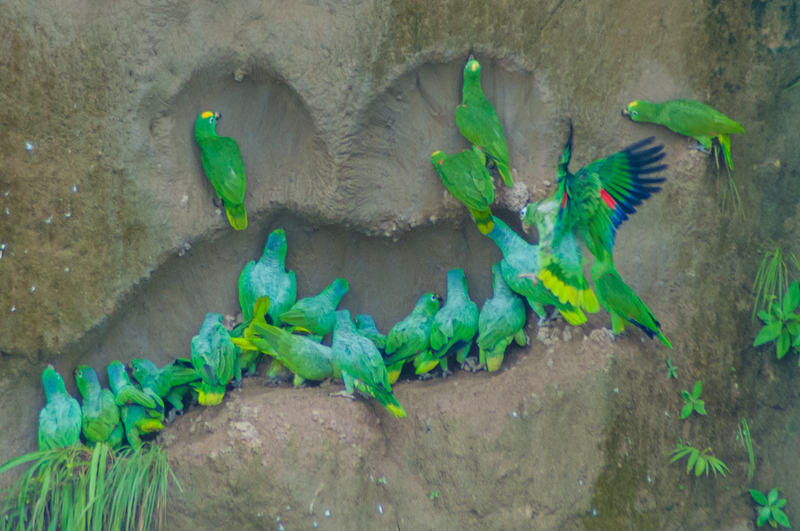 Large flocks of parrots pay a daily visit to a riverside salt lick. In spite of its secluded location deep within the Yasuny National Park, the Napo Wildlife Center eco-lodge is relatively easy to reach. From Quito, the capital of Ecuador (also the connecting point for flights to the Galapagos Islands), a 45-minute daily-scheduled flights deliver travelers to Puerto Francisco de Orellana, Coca for short. Located at the confluence of the Coca and Napo rivers, it is the spot where in 1542 the Spanish explorer who gave the town its name departed on the nine-months river expedition that would take him all the way to the mouth of the Amazon; and earned him his place in history as the discoverer of the Big River. Dugout canoes are a main means of transportation among local people. Getting around is a lot easier these days. A representative from the lodge meets me at Coca airport and escorts me to the modern pier where a motorboat awaits to whisk me on a two-hour scenic ride down the Napo River. The thoughtful staff has even packed a boxed lunch for the trip. We turn into a narrow channel and enter Napo Wildlife Center conservation land. Here we exchange the motorboat for a dugout canoe (no motorized crafts allowed in the conservation area) and silently glide upstream under the thick rainforest canopy echoing with birdcalls. The 2,5 kilometer (1.5 mile) ride to Anangucocha Lake takes a little over one hour. Hoatzin bird reception not guaranteed. Wow, what a trip! You’re making this very difficult; I keep adding places to go based on your posts. I wanna see a hoatzin too. Napo is definitely the place for hoatzins and other amazing critters. 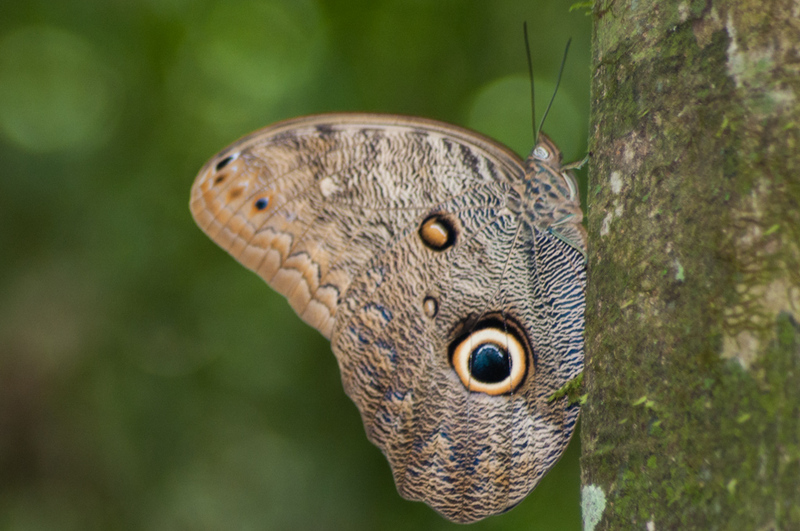 Thanks to the uncompromizing conservation efforts of the Kichwa Anangu community, their corner of the Amazon basin now offers truly unique wildlife viewing! Amazing. The most amazing photos of the “Amaz’on I have ever seen. Thank you so much for sharing your trip with us. Thank you Kathryn. Some of it is luck. I never expected I’d get this close to a caiman LOL! Great article! Quite surprising that this remote place in the Amazon is so easy to reach, well from Quito its 45 min flight. So a perfect extension for any Galapagos trip. Thank you Jan. And it is especially remarkable in that the Kichwa Anangu community has managed the delicate balance of reclaiming the integrity of their ancestral land even as they opened it to visitors.